An exceptional number of people have come to visit the farm this week. Yesterday, I had a visit from my friend Shelly and her daughter Olivia who came to see the lambs. 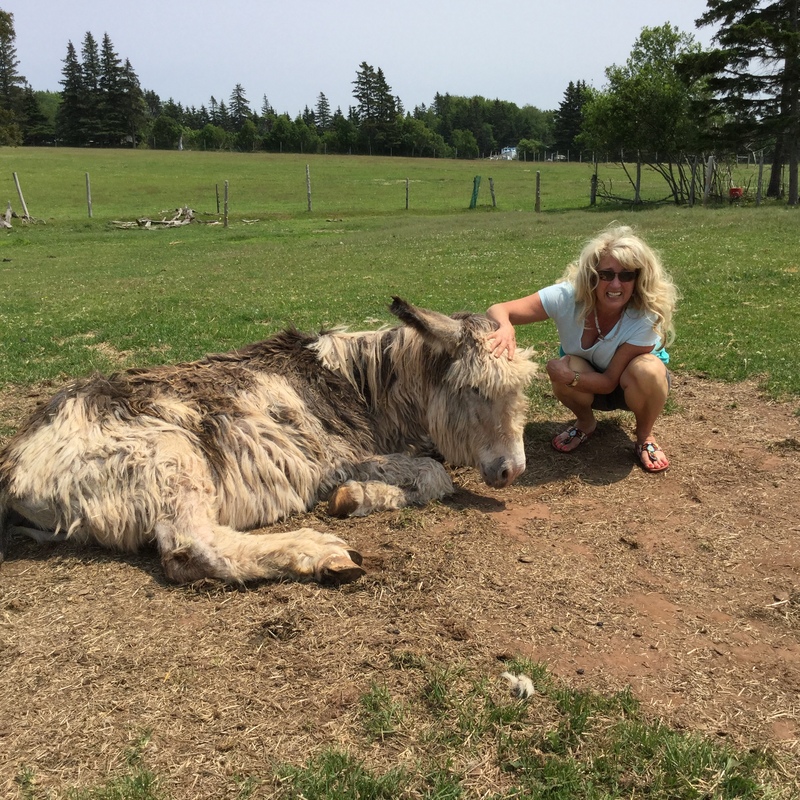 They enjoyed that, and also had a visit with my very ancient donkey. My friends Lisa and Roxanne also visited in the afternoon. Today was a productive day. Poppy the Milking Devon produced a bountiful 10 1/4 lbs of milk this morning. 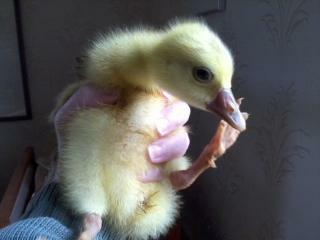 Chicks also began hatching today. 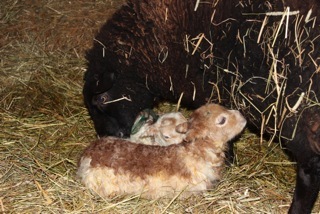 I’ve spent the night nursing a very sick Black Welsh ewe who recently had two lambs. This morning I made a dash into Charlottetown for lamb milk replacer and medications in an attempt to save her and her lambs. In all of North America there are only five living White Welsh Mountain sheep and this ewe is the mother of two of them. Hence the desperate attempt to save her. Elissa and her white and tan lambs. After medicating her with antibiotics, anti-i­nflammatory pain medication and some glucose rich liquid, her eyes brightened and she was up on her feet. I felt she had a fighting chance, so I made arrangements for her to go to UPEI for IV fluids and possible surgery. 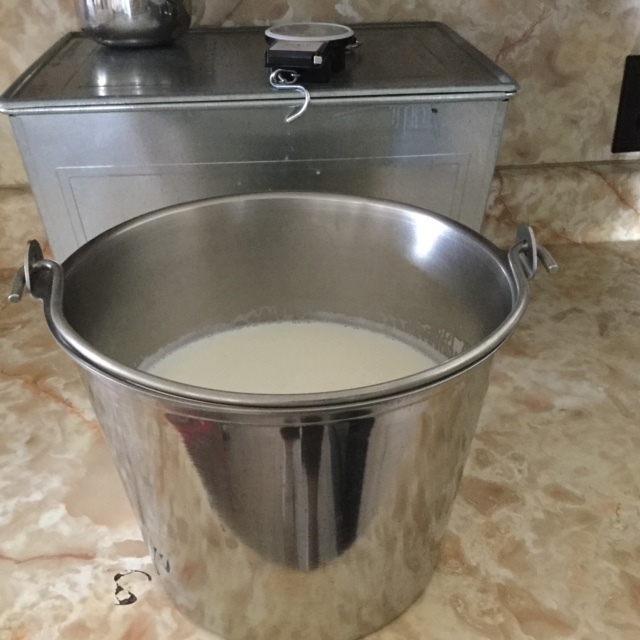 Next, a batch of warm milk replacer was mixed up for the lambs. Then the fun began. Teaching lambs to drink from a bowl after being only on the udder can be a bit of an adventure. The bigger lamb caught on fairly quickly and I was only partially drenched in milk replacer, but the smaller lamb was quite a battle. Afterward, I looked like I’d had a bath in it, with only a small amount ending up in the lamb’s tummy. The lambs will mind their mother being away terribly, but at least they have been handled a lot and now they do not mind being picked up. I will have to remember to add some live culture yogurt to their diet, as they have been exposed to antibiotics. Well, off their mother went in the UPEI trailer. The sad end of the story was that the vet called after examining her and determined her chances were not good. Treatment would be very uncomfortable and unlikely to save her and it was recommended that she be put down. Rest in peace Elissa the ewe. After a long winter, the fields and gardens are finally greening. The tulips planted last fall are beginning to push through the earth. I am hoping that last years strawberries have survived the winter. I have no doubt that the rugged raspberry bush will have made it through, and will be producing abundantly once again. Most years by this time I would have incubators full of hatching eggs and trays of heritage tomato seedlings beginning to sprout. Unfortunately, this was the harshest winter in decades, so my usual pre-spring preparations have been hindered. 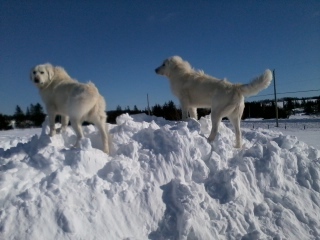 Oysterbed Farm’s working dogs in winter of 2014/15. 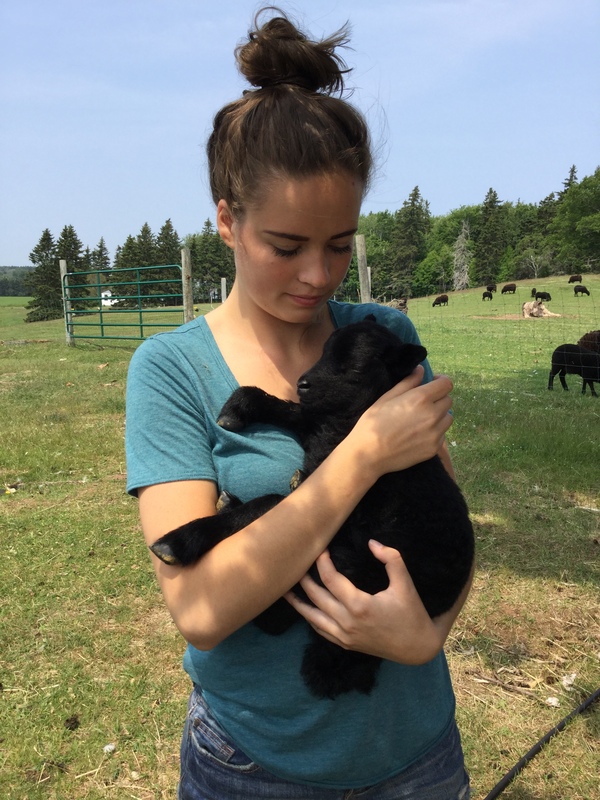 I have been partnering with UPEI as part of their Lamb Survivability Study. There was disappointing news about the sheep test results in the afternoon, and I realized that an ewe that I thought was just a bit lame actually has a bad case of mastitis. I also have a lamb with a rattly chest who is not gaining weight. I thought he was getting better, but now I regret not giving him antibiotics sooner. Sometimes medications will save them and sometimes they will kill them. In the end all you can do is make a decision and then hope for the best. First batch of Black Welsh Mountain lambs. Thankfully, I have a throng of healthy, vigorous lambs frolicking in the pasture. 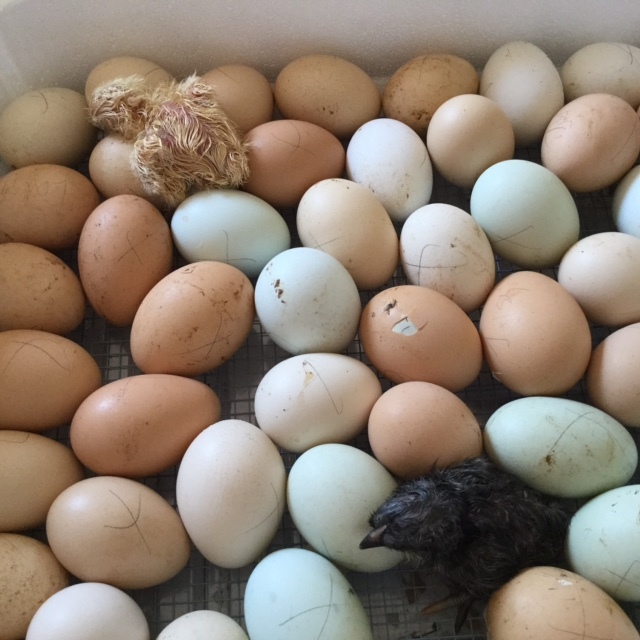 There are also plenty of duck and chicken eggs this spring with customers eagerly awaiting them. 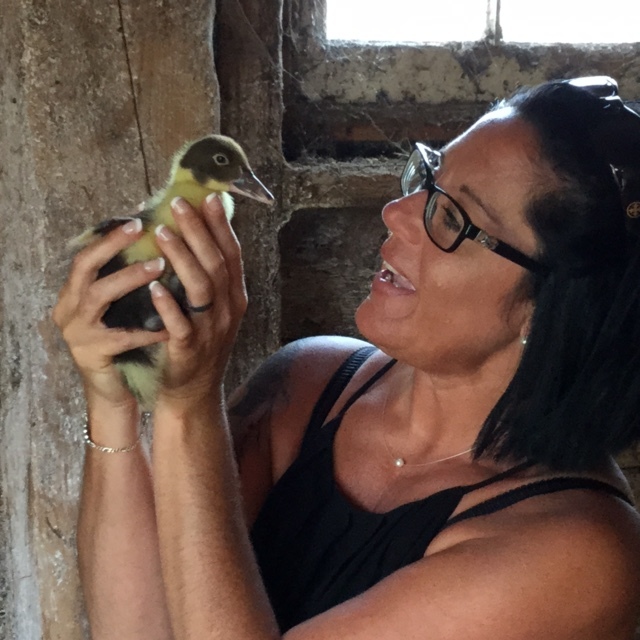 Over the coming months, I’ll be sharing the successes and challenges of life on my farm. I have owned and operated a farm for 30 years, the last 15 of which have been in the community of Oyster Bed, PEI. My focus is on ethical farming practices and the preservation of rare breeds of livestock and poultry. I’m looking forward to sharing my farming experiences with you.